Intraschool moot court competition winners (L-R) are: Chelsey C. Antony, Margaret E. Martin, Michelle M. Sloss, Grace A. Hancock, Joseph S. Trytten, Patrick M. Bollman, Julissa L. Hunte, and Benjamin J. Russell. Trytten and Hunte won the appellate competition and will compete against each other in the Honorary Round in January. Two Tulane Law students are moving on to what is considered the ‘championship round’ of intraschool Moot Court competitions. Hunte has her own mission for taking part in the competition. She works with the Black Law Student Association and coaches the Moot Court team that will take part in the PACE Environmental Law Moot Court competition coming in February. Trytten and Hunte go on to compete in January. 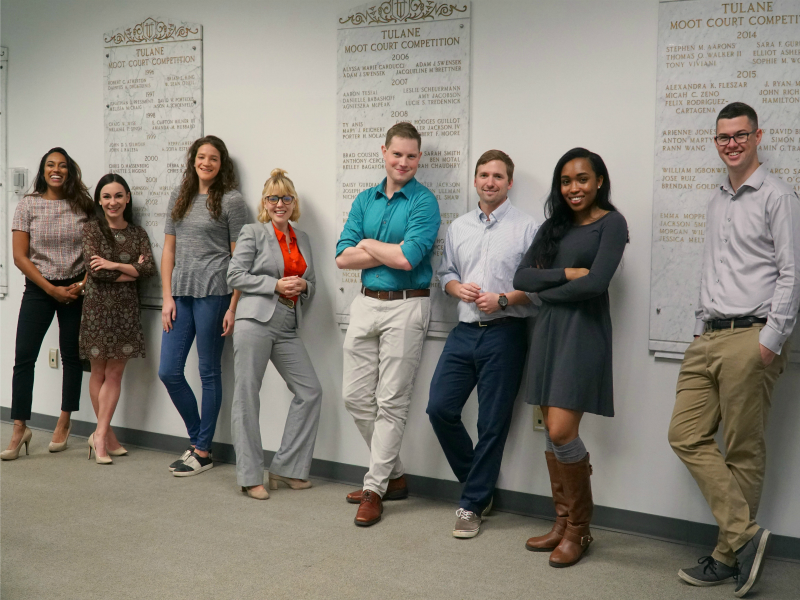 Moot Court competitions have been a Tulane Law tradition for more for more than 80 years, with those who were finalists in the intraschool competition seeing their names carved in six-foot marble tablets along the back wall of the Wendell H. Gauthier Appellate Moot Court Room. Some of the names go back to classes in the 1930s and each year during Homecoming weekend, alumni return to find their names along the wall. In recent years, however, the competition had faded to become a shadow of its former self, usually with judges and competitors the only attendees. Last year, generous donations from alumni – launched with a lead gift from Evan Trestman (L ’77) -- helped revamp the program, and it played out in the spring to a packed house before a distinguished panel of federal judges – all alumni. The moot court program now has 53 students in competitions throughout the year, including the Honorary Round, which tackles a case worthy of Supreme Court consideration. Like going to court and arguing complex cases, Moot Court events are competitive and charged. There is extensive preparation. The students are both friendly with one another – and fierce competitors. The cases call for a critical exploration of the law, arguments backed by precedent, creativity and the cleverness to make a plausible case and swing arbiters in your favor. The Moot Court students who participate in the honorary round are all second and third-years. The program is divided into several categories: Mock Trial, Appellate, Alternative Dispute Resolution, and Willem C. Vis International Arbitration. For the intraschool competition, packets with cases drop early in the fall semester, students prepare, and write oral arguments using only the material available (and cases cited) in the packets. By late November, there are three days of preliminary competition before a panel of ‘judges,’ often recent graduates. In all, eight students see their names go on the marble, all the winners of the early rounds in the various areas of competition. Trytten and Hunte, who competed in the appellate competition, go on to the Honorary Round, mostly to see whose name will go first on the tablets. The other six competition winners are Chelsey C. Antony, Patrick M. Bollman, Grace A. Hancock, Margaret E. Martin, Benjamin J. Russell and Michelle M. Sloss.